Equipment delivery includes the full set of maintenance documentation on paper and on CDs, in Russian and partly in English. MIDIEL engineers take part in the project development stage. MIDIEL engineers take part in erection, commissioning and start-up stages together with the commissioning organizations on site. 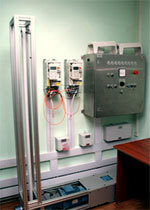 The engineers who take part in start-up and maintenance may have training on the standard units of equipment.